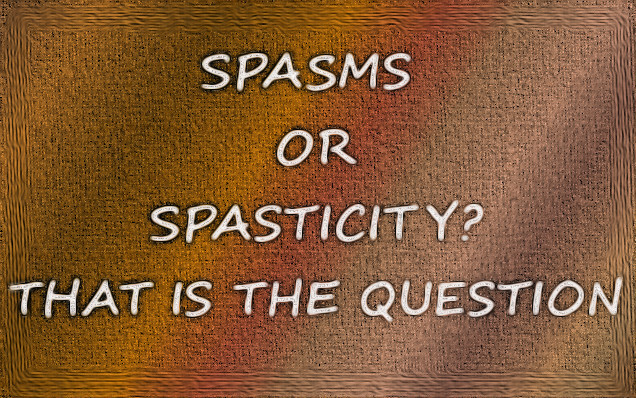 I talked a little about spasms on our page about spasticity. I was forever getting the two of these terms mixed up. I decided to straighten it out once and for all (at least in my own mind) by looking the words up in the dictionary. Smart right? To experience this symptom, according to the dictionary, is to have an "an involuntary and abnormal muscular contraction". 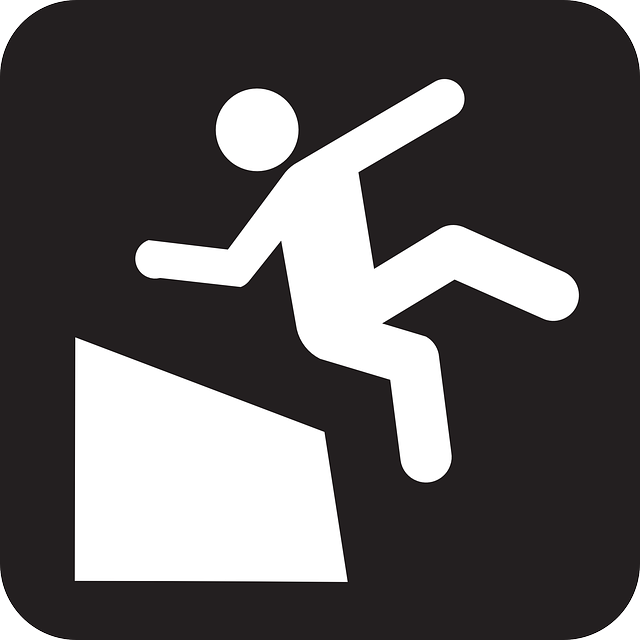 The second definition for it is a "sudden violent and temporary effort, emotion, or sensation". Most of the time I fall asleep way before Cir does. But on those rare occasions when I am awake and he is asleep, I can feel the them, also. He doesn't have very strong ones, but they are enough that I know he's having them. He says it feels like an itch that causes him to jerk suddenly. (He's sometimes in the stage just before he falls asleep when he feels that sensation). Have you ever felt a sudden jolt, kind of like you've been touched by a tiny bolt of lightening? Or an itch that comes on suddenly and makes you jerk? They're kind of like that, only they don't stop. You keep having them over and over. That would be pretty annoying to say the least. That alone would be drive me a little crazy, I think. Sometimes, Cir says if he can reach it and scratch, that helps, but most times it doesn't matter. It happens anyway. So even though the definition says it's a temporary sensation, for MSers it's something you have to live with. When you have multiple sclerosis, your nerves are misfiring because of the damage to your myelin. One of the symptoms caused by the damage are inappropriate sensations like spasms. Sometimes he will have them to where his legs will involuntarily start to spasm or move up and down. Most times he can get it to stop, and sometimes he can make it start by pushing down on his leg. He does this sometimes when the kids are watching. They think it's funny. For some MSers, they may be very strong and so are not a laughing matter. These strong muscle contractions can happen at anytime. We've known a few people with MS who have had them so strong that they have literally knocked them right out of their chairs and on to the floor. Cir's, as I said earlier, usually happen when he's dozing or sleeping. Sometimes he has been sitting in a chair napping and I will notice him twitch a little. But they have never been strong enough to make him fall out of his chair. For him, they are more of an annoyance. The same medication he takes for spasticity, also helps with the spasms. Neurontin or gabapentin is what he takes everyday. This helps to keep them at a manageable level. If he ever forgets to take the gabapentin, he'll notice that he has them more frequently. Once he takes it, they will become more tolerable or go away for awhile. The good thing about them, I guess, is that they are manageable. The bad thing, as I said earlier, is they're something you have to learn to live with. Whatever you find that works for you, do it. Unfortunately, for some MSers, spasms can occur throughout their whole body. These full body contractions can cause extreme pain as muscles tighten up in the back, chest, arms, legs, hands, feet, and even in the face all at the same time. They can last for any length of time. When experiencing them to this extreme, there's almost nothing you can do to stop them except wait it out. The pain can be excruciating. If you've ever had a muscle tighten up because you didn't warm up before doing exercise or playing a game of football, just think of that feeling times 1,000. Cir occasionally has cramps in his feet when he wakes up stretching. I've had that happen, too. The only thing about my cramps is just that - they're "just cramps". MS spasms are a totally different creature. I feel for those who have the extreme form of this symptom, and hope that there is something - whether it's botox, steroids, cannabis, whatever, becomes available for the treatment of this awful, debilitating symptom.